The struggle in semifinals was not particularly fierce. Six game were enough to determine participants of the Championship’s main match. In the opening of the first duel in the match Kosteniuk vs. Ju Wenjun, the World Champion’s play was more precise that in the game she lost to Adams in the previous year. This time, the march of the White’s outside pawn was not enough to stop her from placing her pieces harmoniously. After move 14, the а6-pawn was defended with rook, bishop and queen, so it was hard to imagine that it would find itself in danger in the near future. However, Kosteniuk’s active plan did not give due consideration to a certain tactical subtlety. 18…Nxa6! It turns out that 19.Rxa6 is going to run into double blow 19…Qb7. In fact, White could have held the balance in a highly inventive manner: 20.Nc6! Qxa6 (if 20…Qxc6 21.f3, then the а7-pawn is lost) 21.Nxe7+ Kh8 22.Qe3! 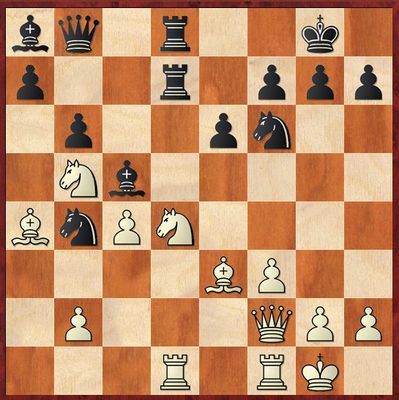 (White promptly creates threats on the kingside) 22…Qb7 23.Qh3 Qxe7 24.Bg5 h6 (24…g6? 25.Qa3!) 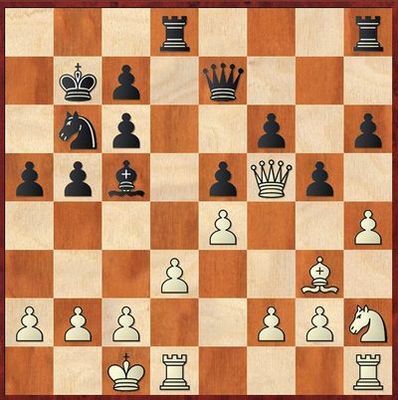 25.Bxh6 gxh6 26.Qxh6+ Kg8 with perpetual check. However, the former Champion of the World did not employ this variation and simply continued playing a pawn down; moreover, her moves only looked solid and safeguarding, but actually could have resulted in a snappy finish. 19.Be3?! (she should have chosen 19.Bg5) 19…Rd7 20.f3?! Nb4 21.Ba4 Bc5 22.Rad1 Rfd8 23.Qf2. Here the Chinese player was not aggressive enough. 23…Qe5! 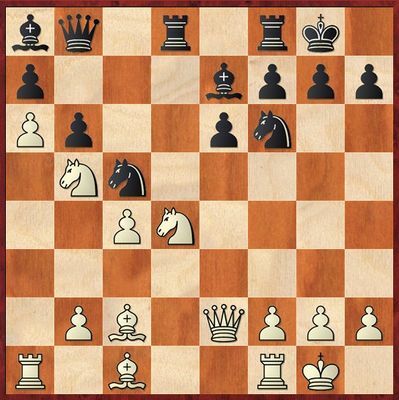 would have critically increased her pressure against the d4-knight, which shielded both insufficiently defended rook on d1 and bishop on e3. 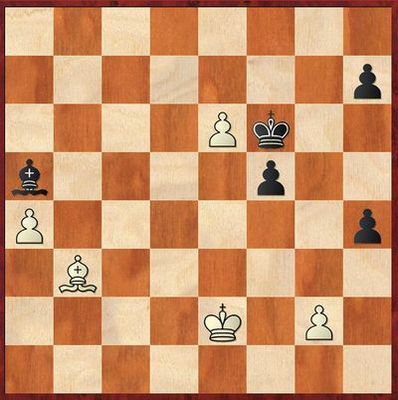 After subsequent а7-а6, White suffers bad losses. After the text 23…Qc8 24.Nc3, Black has at his disposal a blow 24…Rxd4! 25.Rxd4 (25.Bxd4 Rxd4 26.Rxd4 e5) 25…Bxd4 26.Bxd4 Nd3 27.Qh4 (27.Qe3 Nxb2 28.Bxf6 gxf6) 27…e5, and then Nxb2, magnifying her material advantage. Ju once again chose the continuation24…Nc6 that was not the strongest one;exchanges followed, and then Black faced a long realization. However, even during the current championship, the World Champion has more than once demonstrated that she does not mind technical work. After queens had been exchanged, White started advancing her kingside pawns, thus assisting her opponent in creating an outside passed pawn. This soon led to the loss of pawns on the opposite flank, and the rest was elementary. In the second game Ju, just like she had done in a similar situation during her match against Zhai Mo, played out the Maroczy Bind, never allowed a single sharp continuation to happen, drew and guaranteed an extra day-off before finals for herself. There seemed to be nothing remarkable about regular games of the match M. Muzychuk vs. Lagno. In the first one, the position after opening was level and symmetrical; in the second, in the rare branch of the Spanish Opening, Open Defense, Muzychuk accepted a pawn sacrifice with Black, promptly returned material and obtained comfortable equality. Then she unnecessarily transposed to a rook ending with bishops of opposite colors, agreed to a pawn weakness in her camp, but drew effortlessly enough. However, in retrospect we can say that the former Champion of the World’s excessive belief in the redeeming quality of bishops of opposite colors was to do her a disservice later. In the first 25-minute tiebreaker, the Open Defense was played out again. Lagno carried out an exchange sacrifice that had already occurred in practice and yielded poor returns to White. Muzychuk also gained a good position and could have struggled for the advantage in the endgame, but returned material instead and transposed to pure bishops-with-opposite-colors ending. Black should have kept her king on е7 in order to have an opportunity to move it either to f6 or to d6 at the right time. Should white king depart for the queenside to help his a-pawn, Black would play …h3; after gxh3, she would deflect the white bishop with her f-pawn and take on е6, or give up her bishop for the a-pawn with a draw. Muzychuk allowed the enemy king to move to d5, and after the white bishop turned up on the diagonal h3-c8, it was already impossible to stop distant passed pawns. In the return game, the Ukrainian castled queenside when most of her pieces were on the opposite flank. Then there followed an erroneous knight maneuver that was an invitation to a crushing attack for Black. 18…Na4! 19.hxg5. On 19.c3, there follows 19…Ba3! ; a rough continuation is 20.bxa3 Qxa3+ 21.Kd2 Qxc3+ 22.Ke2 (22.Ke3 Nb2) 22…Qc2+ 23.Kf3 h5, and the king has nowhere to hide. 19…Bd4 20.Kd2. After 20.c3, any sacrifice wins: 20…Nxb2,20…Nxc3, 20…Bxc3. 20…Qb4+ 21.Ke2 Qxb2 22.gxf6 Nc3+. Black obtained material advantage and continued her assault that was crowned with success fairly soon.